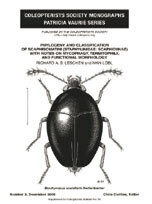 Phylogeny and Classification of Scaphisomatini (Staphylinidae: Scaphidiinae) with Notes on Mycophagy, Termitophiliy, and Functional Morphology, by Richard A. B. Leschen & Ivan Löbl. 63pp.